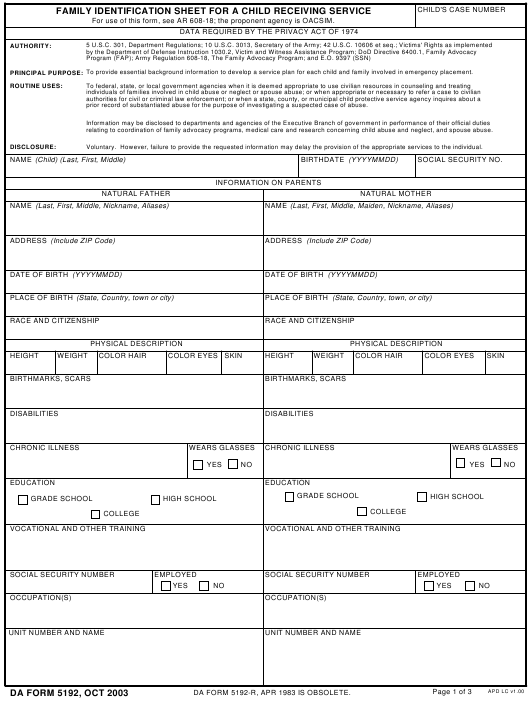 DA Form 5192 - also known as the "Family Identification Sheet For A Child Receiving Service" - is a United States Military form issued by the Department of the Army. The form - often mistakenly referred to as the DD form 5192 - was last revised on October 1, 2003. Download an up-to-date fillable PDF version of the DA 5192 down below or look it up on the Army Publishing Directorate website. To provide essential background information to develop a service plan for each child and family involved in emergency placement. prior record of substantiated abuse for the purpose of investigating a suspected case of abuse. relating to coordination of family advocacy programs, medical care and research concerning child abuse and neglect, and spouse abuse. Voluntary. However, failure to provide the requested information may delay the provision of the appropriate services to the individual. DA FORM 5192-R, APR 1983 IS OBSOLETE.